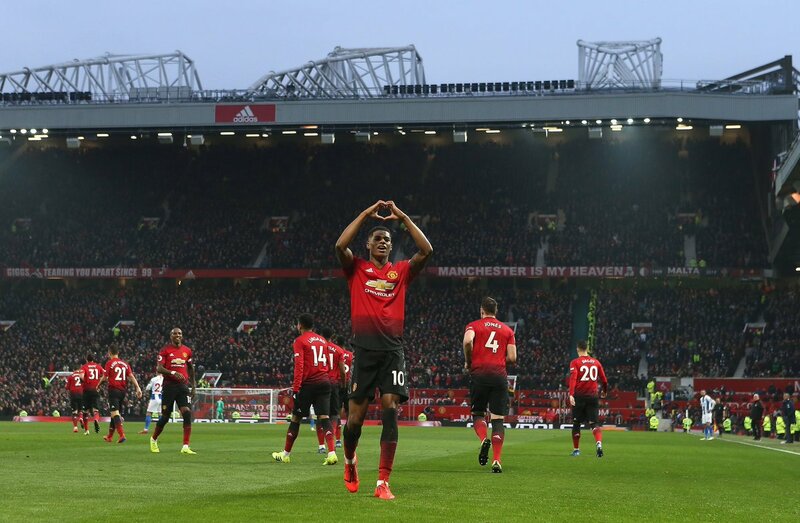 Ole Gunnar Solskjaer believes ever-improving Marcus Rashford can become "absolutely top class" thanks to the Manchester United forward's never-say-die attitude and undoubted ability. Rashford scored a superb strike and was named United's man of the match after an impressive all-action display in the 2-1 defeat of Brighton, taking his goalscoring run to four successive Premier League matches. Solskjaer has tweaked the forward's game at the same time as giving him the chance to express himself and the Old Trafford striking great is excited by his potential. "Definitely he can be absolutely top class," United's interim boss said after his record-breaking start to life in charge continued with a seventh win. "He is only 21 but the maturity he is showing at times is more than 21 and his work rate. "The more you score the more you believe you are going to score, and everyone says when you don't score 'he is bound to score soon'. "The more you score the more chance you have of being confident, running into the same positions. The way he works during the week is fantastic because he practices a lot. "He is a proper Manc - you can't kick him and keep him down. He will stand up for a fight and stand up for himself and a teammate." Solskjaer hailed Rashford's "unbelievable" work rate - exertions which saw him taken off late in a game that he was replaced in straight after being booked for a lunging challenge. That is something the Norwegian believes the player will learn from as he is a "pleasure" to work with. Ashley Young, United's captain against Brighton, has long been a fan of Rashford and believes the striker is benefiting from working under 1999 treble hero Solskjaer. "It's not a bad person to learn off, is it? With the career he had and what a player he was," Young said. "I think he's learning each day and obviously the manager will guide him in the way he does, but, like I say, Marcus just wants to learn. "He's on the training pitch all the time and at times you have to drag him off because he just wants to be out there. "It's fantastic to see, he's got that hunger, that desire, he's a winner, and when you come through the academy here, you've got that in abundance and you can see that when goes out on the pitch every day here. "I've said it from the time he broke into the team and even before then, he can be an unbelievable talent. He's got the world ahead of him. "He wants to learn as well, which is a good thing to see in a youngster now. "He looks like he's been playing for years and years. He's a man ahead of his age and as long as he can keep producing what he does - the finish was unbelievable."